Decking screws are similar to drywall screws except that they have improved corrosion resistance and are generally supplied in a larger gauge. 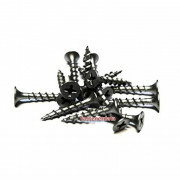 Most deck screws have a type-17 auger type thread cutting tip for installation into decking materials. They have bugle heads or cutting countersinks that allows the screw to depress or cut into the surface without splitting the wood.